The Cambodian Genocide is considered to be a significant example of genocide and crimes against humanity in the 20th century, alongside others, such as: Armenian Genocide, Holodomor, Nanking Massacre, Holocaust, Rwanda Genocide and the Bosnian Genocide. A genocide is defined as a mass killing of a certain group of people based on their religion, ethnicity or cultural background. A crime against humanity is considered to be when a group of people are subjected to humiliation, suffering and death on a mass scale by another group. The Cambodian Genocide occurred in the country of Cambodia between 1975 and 1979. The country of Cambodia is located in south Asia near other nations, including Vietnam and Laos. The genocide and crimes against humanity that occurred in the country are considered to be the actions and result of the Khmer Rouge and Pol Pot. The Khmer Rouge was the name of the communists in Cambodia. The term ‘Khmer’ relates to an ancient kingdom that once existed in the region of south Asia, while the term ‘Rouge’ means red in French. Throughout the 20th century, the color red was often associated with communist countries such as the Soviet Union and China. 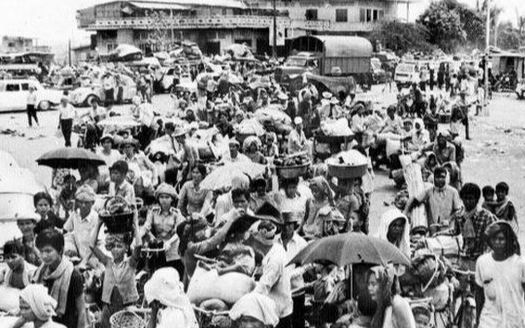 The Khmer Rouge began to emerge out of Eastern Cambodia during the 1960s and the timeframe of the Vietnam War. At the time, the United States was entangled in a major military conflict with North Vietnamese communists. As such, the communist movement in Cambodia developed alongside the violence and brutality of the Vietnam War and enjoyed continual support from communist neighbors in both Vietnam and China. They engaged in an ongoing fight with the ruling party of Cambodia during this time. It wasn’t until 1975 that the Khmer Rouge won the civil war in the country and established their own government under the leadership of Pol Pot. Pol Pot, born Saloth Sar, was the name of the Cambodian dictator who ruled over the country and carried out the major events of the Cambodian Genocide. Officially, he was the Prime Minister of Democratic Kampuchea, which was the name given to the state of Cambodia while under control of the communists. He ruled in this position from 1976 until 1979 which were the major years of the Cambodian Genocide. Additionally, he ruled over the Communist Party of Cambodia from 1963 to 1981. 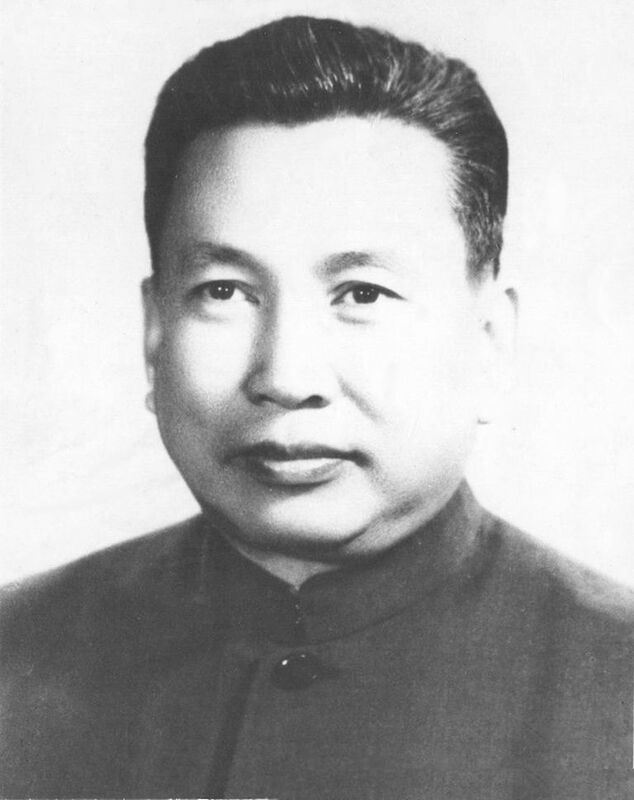 Ideologically, Pol Pot considered himself to be a Marxist-Leninist. This means that he believed in a collectivist state in which the means of production were owned by the government for the benefit of the entire society. In principle, these ideas were supposed to be based on the ideas of Karl Marx and the ideology of Vladimir Lenin in the Russian Revolution. He even spent a period of time in Europe in the 1940s where he was influenced by the Marxist movement. When the communists grabbed power in Cambodia in 1975, Pol Pot began ruling over the country as a totalitarian dictator, and the events of the genocide began to unfold. After capturing Phnom Penh, the Cambodian capital on April 17th, 1975, Pol Pot and the communist leaders set out straight away to transform the country into a classless society based on Marxist ideals. For example, they ordered people out of the capital and other cities and forced them to relocate to the Cambodian countryside. The communist leadership did this to force Cambodian people to work on collective farms and transform the country into an agrarian-based economy. This meant that people in the cities lost all of their possessions and lifestyles and were forcibly removed to government owned and operated farms. This process led to the genocidal acts carried out by Pol Pot and the regime of the Khmer Rouge. A key feature of any genocide is the focused and mass killing of different groups of people based on their religious or ethnic background. This was especially true in the Cambodian Genocide because the Khmer targeted different groups, including: ethnic Vietnamese, ethnic Chinese, Christians and Buddhists. As well, educated professionals and members of rival political parties were systematically removed from their positions and forced out of the city-centers. Essentially, Pol Pot and the Khmer Rouge focused their power against groups of people they did not deem to be ‘desirable’ to Cambodia or who had the intellectual ability to question the authority of the government. Many of the first deaths of the Cambodian Genocide were a result of the forced removals from the cities. For example, anyone that was unwilling to relocate was either forcibly removed or executed. Furthermore, many people died from exhaustion and starvation during the process. This worked in the benefit of the Khmer Rouge as it led to the deaths of the groups of people that the Khmer wanted to remove from the country anyways. However, anyone that survived the transportation to the countryside suffered due to the grueling work that was expected on the collective farms. In fact, the farms were little more than labor camps in which the workers experienced continual abuse, threat of death and exhausting work. Many more died there also from starvation and exhaustion. As time progressed, the survival of a person was determined by the ability to complete work in the labor camps. As a result, many people who could not keep up with the work demands of the Khmer were killed, including: young children, elderly and the sick. 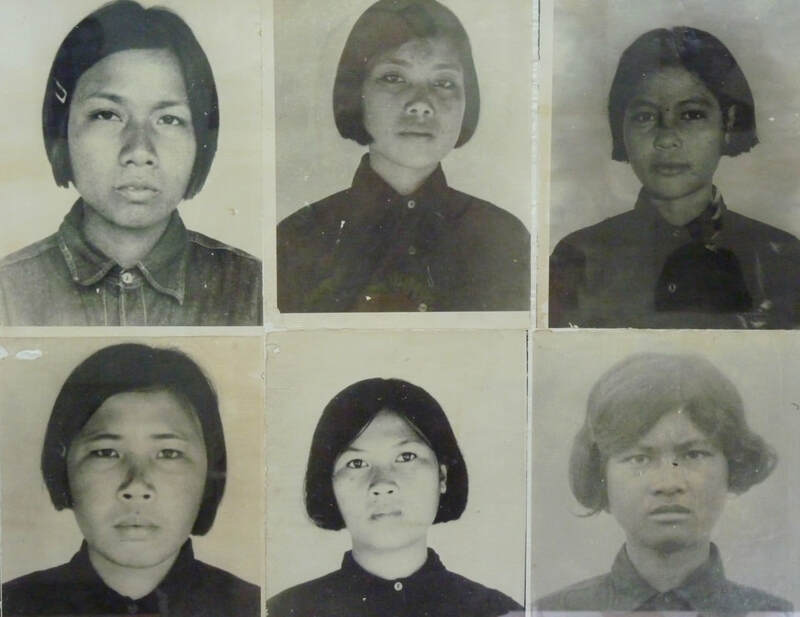 When starvation no longer resulted in the deaths of these ‘undesirable’ people, the Khmer Rouge resorted to a method that historians refer to as the ‘Killing Fields’. In general, the term ‘Killing Fields’ refers to sites across Cambodia in which people were taken to be tortured, interrogated and executed for their alleged crimes against the state. Most of the estimated one million victims, were buried in mass graves. The most famous of these sites was called Security Prison 21 (S-21), which was a former high school just outside of the Cambodian capital. 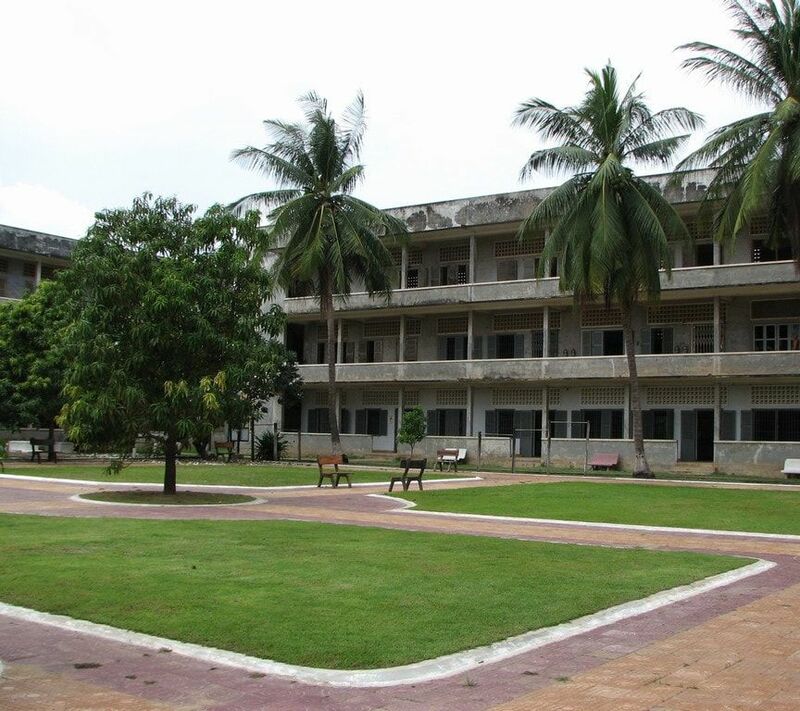 The high school was transformed into a detention center in 1975 during the reign of the Khmer Rouge in which ‘enemies’ of the state were tortured and eventually executed. For example, the building was encircled by electrified barbwire and the classrooms were rebuilt into prisons and torture chambers with the use of bars on the windows and doors. Historians are unsure of how many prisoners went through S-21 but it is estimated that as much as 17,000 were executed at the site. Since the Khmer Rouge kept detailed notes and photographs of all of the prisoners, it is relatively easy to estimate the number. Photos of victims of the Security Prison 21 (S-21). In total, the building could hold between 1000 and 1500 prisoners at any one time. Daily life for these prisoners was difficult. They were kept shackled for the majority of the day and held in small cramped prison cells. Any movement or actions by the prisoners had to be first approved by the guards, and if the prisoners did something without approval they could be severely beaten. They were fed very small portions of rice and watery soup twice a day. Out of starvation or as a punishment the prisoners were sometimes forced to eat their own feces and drink their own urine. Beyond that they faced continual torture and interrogation, as the Khmer Regime attempted to gain information from them. Often, prisoners provided information against family and friends which resulted in further arrests and detentions. Ultimately, S-21 was discovered in 1979 by a Vietnamese photographer. Today, the prison is a museum called Tuol Sleng Genocide Museum and contains photographs and information honoring the legacy of the victims and acknowledging the brutality of the Cambodian Genocide. 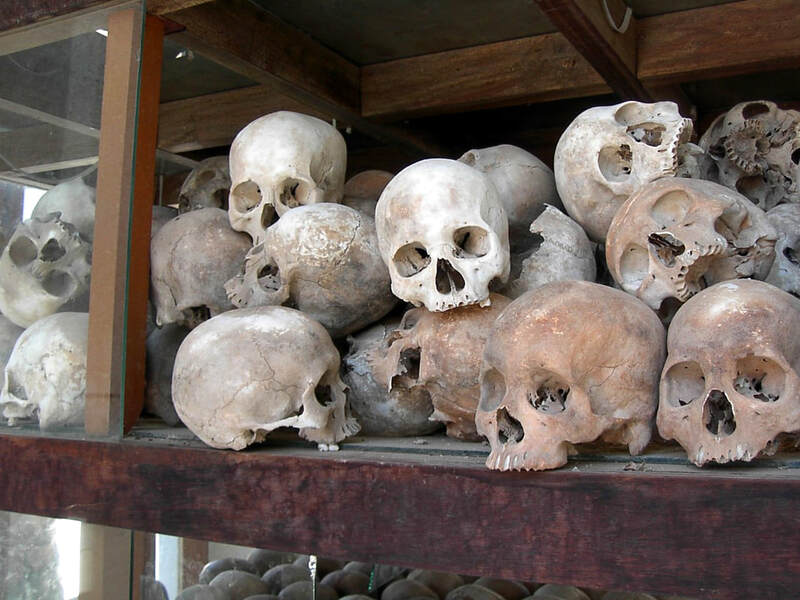 Skulls of victims from the Cambodian Genocide. In all, it is estimated that as many as 1.5 million to 3 million people died in the killing fields and as a result of the events of the Cambodian Genocide which occurred between 1975 and 1979. To date, over 23,000 mass graves have been discovered in Cambodia containing the majority of the reported victims. The international community was slow to learn about the genocide and crimes against humanity occurring in the country due to the Khmer Rouge expelling foreigners and reporters. Regardless, news of the genocide leaked out and most foreign countries condemned the actions of the Khmer. However, the regime also enjoyed support from several communist nations including China who is said to have supplied them with money, military supplies and training for soldiers. The reign of the Khmer Rouge and the Cambodian Genocide ultimately ended in 1979 when Vietnamese forces invaded the country and toppled the rule of Pol Pot. The Cambodian dictator fled and lived out much of his remaining years on the Cambodian border with Thailand where he would often move between the two countries. While the Khmer Rouge remained a force in the region throughout the 1980s and 1990s, it lost its power and ability to rule especially with the ‘retirement’ of Pol Pot in 1985. In 2001, the Cambodian government established the Khmer Rouge Tribunals for the purpose of trying leaders of the Khmer Rouge during the Cambodian Genocide. It was a national court established by the Cambodian government but supported by the United Nations with some international lawyers and judges. The full name for the tribunals was ‘Extraordinary Chambers in the Courts of Cambodia’ or ECCC. In general, the perpetrators of the Cambodian Genocide were accused and made to stand trial for genocide, crimes against humanity and war crimes. For example, one of the people tried at the tribunals was Kang Kek Iew. He was a former leader of the Khmer Rouge who was in charge of the prison camp system and oversaw the operation of the notorious S-21 camp. In July of 2010, he was found guilty of crimes against humanity and was ultimately sentenced to life in prison. 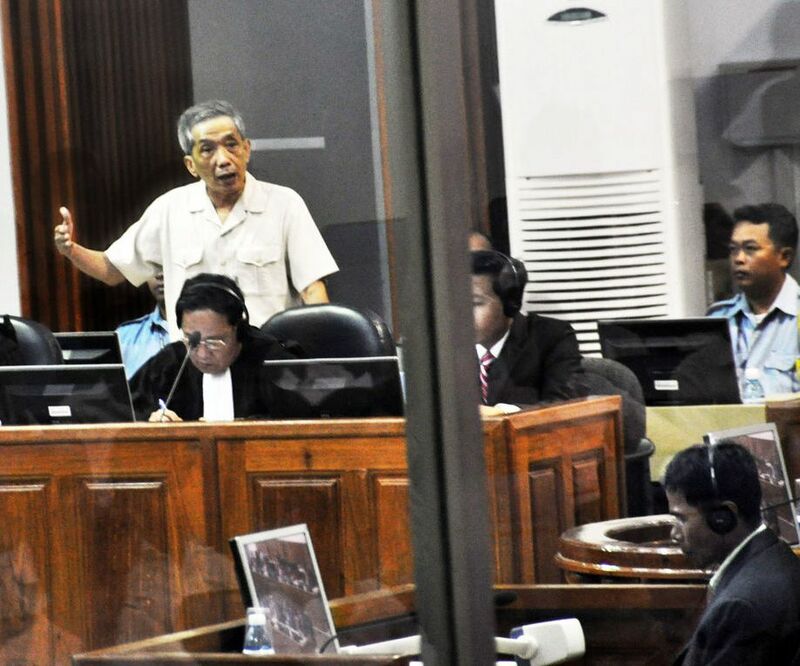 Kang Kek lew on trial at the Khmer Rouge Tribunals. Other prominent leaders tried during the tribunals included: Nuon Chea, Leng Sary, Leng Thirith and Khieu Samphan. Nuon Chea is said to have been the ‘right-hand’ man of leader Pol Pot and oversaw many aspects of the Cambodian Genocide, including: torture, murder, interrogation, etc. In August of 2014, he received a life sentence related to crimes against humanity. Leng Sary was the Deputy Prime Minister for Foreign Affairs for the Khmer Rouge during the height of the genocide and was for crimes against humanity. He died in March of 2013 in the midst of the tribunal, after which proceedings against him were stopped. Leng Thirith was the wife of Leng Sary and sister-in-law to Pol Pot. She is said to have helped orchestrate some of the forced deportations to the labor camps and the mass executions. She never stood trial for her alleged crimes because she was deemed unfit for trial due to Alzheimer Disease. She died in August of 2015. Khieu Samphan was a senior leader in the Khmer Rouge and replaced Pol Pot in 1987. He was officially sentenced in August of 2014 for crimes against humanity and sentenced to life in prison. A major issuing facing the tribunals carried out in the first part of the 21st century was the many of the former Khmer leaders were either dead or had fled the country to other parts of the world. For example, the Khmer Rouge leader responsible for the Cambodian Genocide, Pol Pot, evaded trial for his role. He lived out the remaining years of his life along the western border of Cambodia or in the country of Thailand. He died on April 15th, 1998 from heart failure. However, some historians suggest that he might have committed suicide or been poisoned since he was supposedly going to be turned over to Cambodian officials in order to face justice for his crimes. In an interview he gave late in his life, Pol Pot, claimed he had no regrets and denied his involvement in mass killings during the genocide.